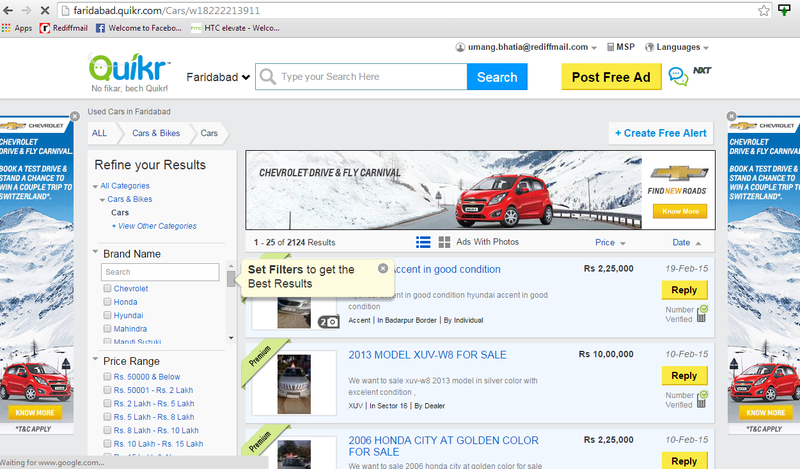 Home Article Upgrade my Car with Quikr NXT! After finishing my graduation in tourism, I took the initiative to complete my post graduation and got an admission in a good college. The reporting time for my college was 9 am in the morning and the issue for me was that it took me at least two hours via public transport to reach on time and often I used to miss my first lecture. This was affecting my studies and monthly report and so I decided to buy myself a second hand car. At the same point of time, my neighbour was interested in selling his old maruti alto car and so I decided to buy at good discount price. The best part was that I could reach college within 60 minutes and my monthly report attendance increased from 40 to 75 percent. Two years have passed now and I have now completed my post graduation and got placed in multinational company. I still commute daily in my alto car but it performance has degraded a lot and it is not a smooth ride any more. My monthly car maintenance has increased and it is burning more fuel and cannot be trusted for long drive. Everyone has suggested me to buy a new car instead of wasting money on giving this car another makeover. I want to buy a new car but there are financial issues and so decided to sell my old car now and upgrade to something better than my Alto car. It is very difficult to search for prospective buyer and find a trusted seller until you know someone in your social circle. I have been trying many offline agents and dealers who are expert but they charge a lot of commission. Being a geek, I have been trying to put my car on sale on various e-commerce sites as e-commerce industry is taking competitive edge over traditional way of selling and people feel more comfortable while using text or web chat support. I have been a regular user of Quikr website which provides free service to the buyer and seller where we can choose different categories and find the right product or be a seller for our product. 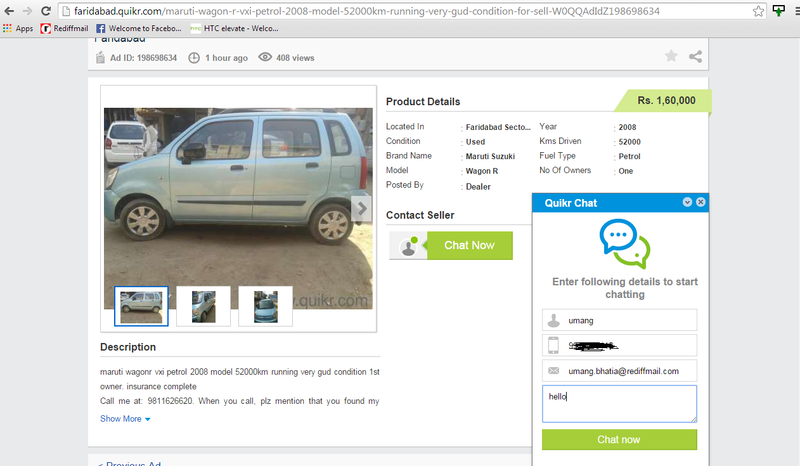 I completely trust the Quikr website to upgrade my existing car to something better due to its revolutionary QuikrNxt feature. I can choose my city while buying a new car on Quikr so that I save both time and money. Further with Quikr NXT, I have an option to hide my personal contact details and email address and there will be no point, I am getting spam messages or calls from sellers. The best part is that there is no obligation on me or commission charged by a third party. With Quikr NXT chat history feature, the online classified portal has given me an option to have chat record before we go out for the final deal offer with the buyer. I like the chat history option because it gives me better transparency and being able to ask questions regarding condition of the car and model number, car documents etc. I can further ask him to send me real time pictures of the car from all angles. After browsing and deciding my criteria, I found this WagonR which suits my budget plus all specifications. I like its colour and its looks. It almost satisfies all my conditions and now I am looking forward to contact the buyer using Quikr NXT feature and get more details about the car.